30ft of classic Bates Star Craft. Built in 1952, for the same price as two semi-detached houses! Says a lot – good design, quality materials and fittings, handmade by craftsmen. The obvious one is the engine change, from petrol to a BMC 1.5 diesel and the fitting of a ‘Jet thruster’! 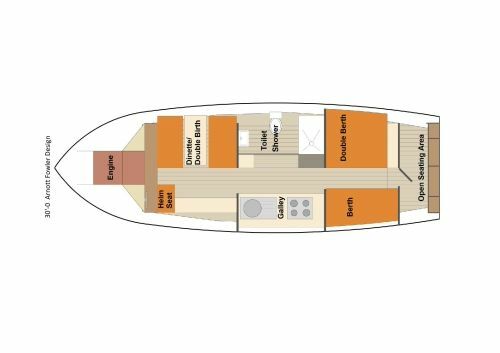 To bring her in line with current BSS standards, we have paid attention to many areas, entirely replacing the saloon windows, additional water tanks, a 1000 w inverter, a new fridge and additional worktop space and storage in the galley. New mattresses have been fitted to the forward cabin and memory foam toppers available for the saloon berths. Central heating has been fitted, with radiators in the forward berth, head and saloon. We also include a TV with internal DVD and a Stereo DAB radio - that can play music from your phone too. Tea, Coffee and Sugar. essential spices if you like to cook! Claudette has now joined the 'fleet'. A lot of the work has gone into her, and the results are just how we wanted her to be. We have managed to keep most of the mahogany interior, but painted the ceiling white to give her a light and airy feel - the oak beams have been kept too. She is painted and varnished inside and out. She has had a bow thruster fitted and there are new appliances, alongside existing features, and warm air heating. Claudette has everything on board that Bernadette has. Claudette has a ‘forward helm’ position, and the roof of the saloon goes back leaving the saloon completely open. Jeff has fitted a mechanism that makes it really easy to retract. Claudette is a very popular addition! EVETTE - 2 BERTH (poss 4)- A Freeman 23' - will be ready for next season! Antoinette – 4/6 berth - A Herbert Woods ‘Silver Light’ - 30’ - to follow - can't wait - she's going to be gRRRRreat!